Milestone have released their XProtect Mobile application, allowing users of Milestone video management software to access their CCTV system while on the move. In this first release, support is available for Android-based phones and tablets with iPhone and iPad compatibility expected to follow in spring 2012 [update May 2012 – iPhone and iPad versions now available]. We have received the pleasant news that Lilin is dropping their prices in preparation for 2012. The permanent price reduction also includes their recent, much improved Lilin IP camera range. We have adopted the new Lilin 2012 prices as from today. With this move, Lilin is starting to offer some excellent value for money. On some models they are now simply hard to beat. As was expected for a while we have recently received a statement from Sanyo Electric announcing their complete withdrawal from the market. This covers everything from TVs, microwaves, projectors and also CCTV. The official wrap up of the organisation will be 31st March 2012. However, production actually ceased in July 2011. Therefore any current gaps in inventory will not be replenished and once stocks sell out we will not be able to source additional stock. Sanyo advise that they will continue to honour their warranty repairs and service obligations. Further details of how this will be managed will be communicated soon. It’s a shame to see Sanyo disappear since the IP CCTV line up was a strong offering at a good price-point and has been used in many security installations. For existing Sanyo users who wish to complement their existing installations check the range at our IP camera store. Please note that items may become unavailable at any time. Two weeks ago at the Milestone Integration Partner conference in Copenhagen (which they like to call MIPS), Milestone announced the launch of an addition to its XProtect video management software suite. It’s called Xprotect Express and it’s positioned in-between Milestone’s entry-level product XProtect Essential and the more advanced XProtect Professional. We think Milestone are spot on introducing a product that bridges a gap that was too wide. With a base license (including 2 camera licenses) available from just £129 / €149 and additional camera licenses at just £64 / €74 each, Xprotect Express offers an affordable CCTV surveillance platform that goes beyond the limitations of XProtect Essential but does not have the price tag of XProtect Professional. So, what does XProtect Express give you? FAQ: Can I View My IP Camera With My Phone? With the improvements to mobile phone hardware and the reduction in prices for bandwidth, it’s no wonder that many people are trying to integrate their phones with their security systems. The benefits are great; while away from home you can immediately log into your cameras and ensure that nothing is wrong. However, despite the fact that modern phones are powerful, they are not fully fledged computers, meaning that there are limitations which can prevent video or images from being displayed. We’ve taken a look at some of the main IP camera manufacturers to see how their cameras cope with mobile viewing, and explore any limitations found. At NW Systems we like a good deal. If we find an IP camera with great image quality, tonnes of functionality and a small price tag, we love it, and we make sure other people hear about it. However, every now and again someone will come to us and say they want the best of the best. They want equipment that does everything they could ever need without any compromise. So, whether you’ve just won the lottery, are installing security cameras for a millionaire or compiling a geeky Christmas list, here we run down the cameras that we would buy if we threw the budget out of the window, and why. 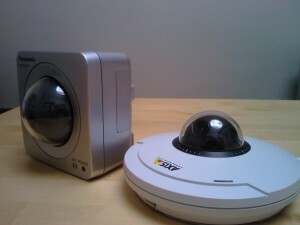 In this how to guide, we’ll set up motion detection email notifications with an image attachment on a Panasonic camera. Having an IP camera can give you a lot of reassurance when away from home. However, it’s implausible to monitor the camera 24 hours a day, so it’s handy to be notified in the event something happens. 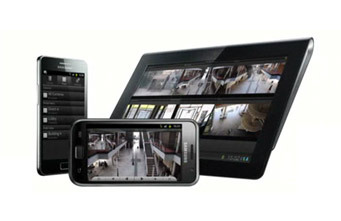 Panasonic IP cameras offer this functionality. By setting up motion detection and integrating it with an email service, you can be notified if an event takes place and even have the camera send you an image so that you can quickly see what’s happened. This how-to covers the setup of email notifications on all Panasonic BB and BL cameras. We have used a Panasonic BL-C160 for testing, but other cameras in the range will be all but identical. We’ve taken a look at two mid-level, megapixel pan/tilt cameras; the Axis M5014 and the Panasonic BB-HCM715. If you haven’t already seen part one of our comparison of, read it first. In this part of our comparison, we’ll have a look at the recording system on both cameras, event detection, audio, user interface and price, before delivering our verdict. ￼Up until recently, there have only been a few mid-level IP cameras which offer both pan/tilt and megapixel quality video, Panasonic BB-HCM715 being the most popular. Superseding the BB-HCM511, the BB-HCM715 comes with a compact camera housing, audio support, on-camera SD card recording and Power over Ethernet connectivity. The wide feature range and competitive price have appealed to many users. However, hot off the production line are the new Axis M50 series of cameras. Two models are available, capable of either SVGA (M5013) or HD 720p (M5014) resolution, which look to be aimed at the same market as the BB-HCM715. In this comparison, we’ll be looking at the Axis M5014. So, how does the new kid stand up to the seasoned leader? Lets take a look.